Stan Kroenke, the owner of Arsenal Football Club, has ordered big game hunting videos to be removed from the MyOutdoorTV (MOTV) app. MOTV is a paid-for video on demand app about hunting, shooting and fishing, and was launched in the US in 2016. 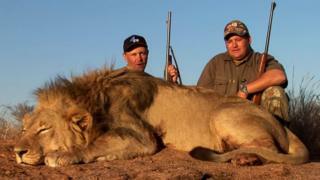 It was launched this week in the UK, but immediately attracted criticism for carrying video of hunters with dead lions and other animals. Mr Kroenke owns the company behind MOTV. It is a small part of his huge Colorado-based sporting empire, Kroenke Sports & Entertainment, which runs TV stations including The Outdoor Channel and World Fishing Network. The range of programmes is not available in every country, partly for reasons of ownership rights, but also in some cases because of local tastes. Its website illustrates this, pointing out that some TV shows that are popular with members in the US may not be desirable to members in the Canada, even though they are both English-speaking regions. The company said: "There has been significant public attention to a small portion of programming on our MyOutdoorTV app that contains content associated with hunting certain big game animals," said Jim Liberatore, the chief executive of Outdoor Sportsman Group. "Stan Kroenke has directed us to remove all content related to those animals in light of the public interest," he said in a statement. The company was keen to underline that it operates independently from Arsenal Football Club. "Arsenal Football Club has nothing to do with any of our media outlets. It has nothing to do with our content or the editorial decisions we make," the statement said. "We deserve no credit when an Arsenal striker scores a goal. Arsenal deserves no criticism when we offer a program with which some disagree." Leader of the Labour opposition and local MP, Jeremy Corbyn, said he was "disgusted" by the channel: "As an Arsenal fan I'm disgusted that Stan Kroenke is involved in such a brutal, unethical and unnecessary activity." Robert Peston, ITV's political editor and one of Arsenal's best know fans, expressed his disgust about Mr Kroenke's connection to the channel. In a tweet earlier this week he said: "I feel sick I have to pay money to this person." Philippa King, from the League Against Cruel Sports, welcomed today's move: "Launching a TV channel which glorifies bloodsports was never going to be a good idea in a nation of animal lovers. We asked Mr Kroenke to cancel his plan to show trophy hunting and that's what he has done, so we thank him for it. "Whether the decision was taken because his eyes were opened to the suffering of animals involved in trophy hunting, or because he realised it was a PR disaster for Arsenal football club, I don't know. Hopefully it was the former."